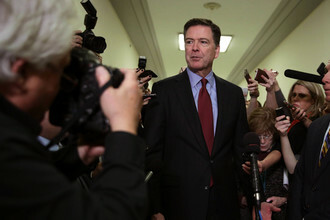 Former FBI Director James Comey on Tuesday condemned President Donald Trump's calls for a possible investigation into how special counsel Robert Mueller's Russia inquiry started, adding that it creates a troubling precedent. During an interview with CNN's Christiane Amanpour, Comey was asked about whether he feared possible counterinvestigations. "I don't fear it personally. I fear it as a citizen," he said. "Right? Investigate what? Investigate that investigations were conducted? What would be the crime you'd be investigating? So it's a terrible cycle to start."